What's the surest way to startup failure? Follow old, outdated rules. In Content Inc., one of today's most sought-after content-marketing strategists reveals a new model for entrepreneurial success. Simply put, it's about developing valuable content, building an audience around that content, and then creating a product for that audience. Author Joe Pulizzi flips the traditional entrepreneurial approach of first creating a product and then trying to find customers. It's a brilliant reverse-engineering of a model that rarely succeeds. The radical six-step business-building process revealed in this book is smart, simple, practical, and cost-effective. And best of all, it works. It's a strategy Pulizzi used to build his own successful company, Content Marketing Institute, which has landed on Inc. magazine's list of fastest growing private companies for three years straight. It's also a strategy countless other entrepreneurs use to build their own multi-million dollar companies. Build an audience and you'll be able to sell pretty much anything you want. Today's markets are more dynamic and customers are more fickle than ever before. Why would you put all your eggs in one basket before securing a loyal customer base? Content Inc. shows you how to get customers first and develop products later. It's the best way to build a solid, long-lasting business positioned for today's content-driven world. This is the simple but profoundly successful entrepreneurial approach of one of today's most creative business minds. This model has worked wonders for Pulizzi and countless other examples detailed in the book. Connect these six pieces like a puzzle, and before you know it, you'll be running your own profitable, scalable business. Pulizzi walks you step by step through the process, based on his own success (and failures) and real-world multi-million dollar examples from multiple industries and countries. Whether you're seeking to start a brand-new business or drive innovation in an existing one, Content Inc. provides everything you need to reverse-engineer the traditional entrepreneurial model for better, more sustainable success. Joe Pulizzi is an entrepreneur, professional speaker, and podcaster. He is the founder of several startups, including the Content Marketing Institute (CMI), recognized as the fastest growing business media company by Inc. magazine in 2014. CMI produces Content Marketing World, the world's largest content marketing event, and publishes the leading content marketing magazine, Chief Content Officer. 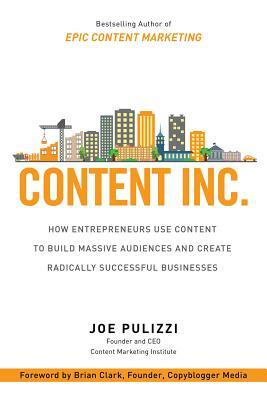 Pulizzi's book Epic Content Marketing was named one of Fortune magazine's Five Must Read Business Books of the Year. Joe Pulizzi (Cleveland, OH) is the founder of the Content Marketing Institute (CMI), the leading content marketing educational resource for enterprise brands.